Len Julians is fondly remembered by Gor Mahia fans as perhaps the greatest coach ever to coach Gor Mahia football club. He coached the club to 3 successive league titles from 1983 to 1985 and again in 1991. He is also credited with grooming what is perhaps the greatest generation of players ever to play for any club in Kenya. Players like Charles Otieno whom Julians nicknamed “the engine”, Abbas Magongo, John Okello “Zangi” , Abdallah Shebe, Hesborn Omollo, Sammy Onyango and many others all came of age and became legends under coach Julians. Leonard Bruce Julians was born in Tottenham London on 19th June 1933. 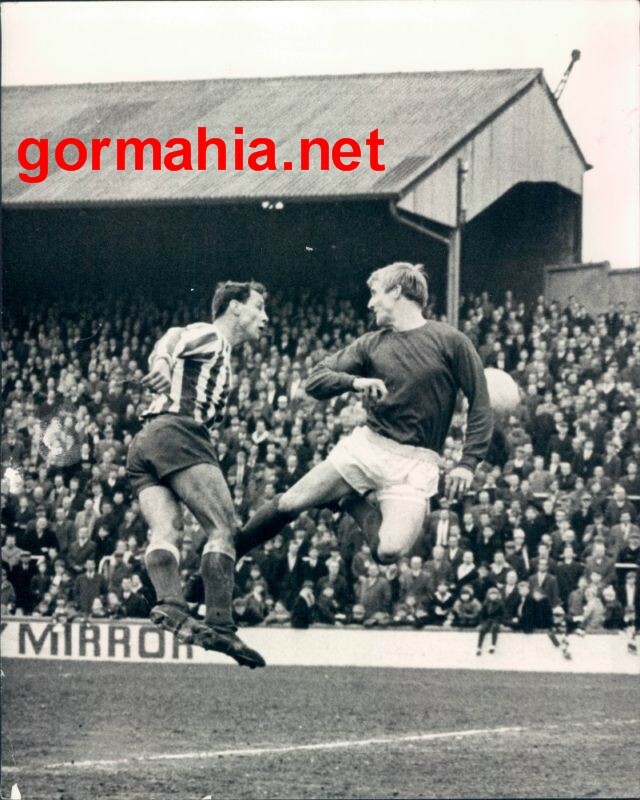 His first club was Leyton Orient whom he joined as a centre forward in 1955. After three years at Leyton Orient and a stellar record, Julians was spotted by Arsenal scouts who convinced him to join the gunners in 1958. Upon joining Arsenal, he scored on his debut, in a match against Luton Town. Playing as a centre forward for Arsenal , Julians scored 10 goals in 24 starts between 1958 and 1960. It was a superb scoring record which is why he was remembered fondly by many Arsenal fans of the time. Many of his goals were superb well taken strikes with good technique. Despite playing as a centre forward, Julians was also an excellent passer and set up several goals for his team-mates. As such he also occasionally operated as a winger or an attacking midfielder. He was versatile. However at the time, Arsenal had a galaxy of strikers and competition was tough. So at the end of the 1960 season, Julians joined another top tier team, Nottingham Foreast. At Nottingham Foreast, Julians stayed for 4 season, making 125 appearances and scoring an incredible 58 goals. An excellent strike rate for someone who played several positions. After leaving Nottingham Foreast, Julians joined Millwall who at the time were playing in the English lower tiers. In his first season there, Julians scored 16 total goals including a memorable hat-trick against Halifax. At Millwall, Julians scored a total of 22 goals in 45 appearances between 1964 and 1966, helping them gain back to back promotions. During his stay at Millwall, the team set a record of playing 59 home games without loosing. Julians played a key role in setting that record including scoring the equalizing goal when the record was set. He stayed on at Millwall until 1968. He is rememebered as one of the greatest players ever to play for Millwall. 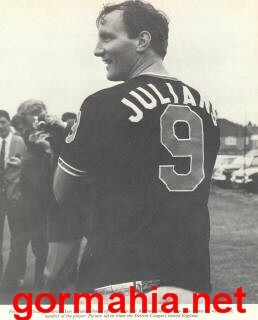 Upon leaving Millwall, Julians now in the twilight of his playing career, went to play in the fledgling North American Soccer league where he was player-coach for the Detroit Cougars. Injuries brought his playing career to an end and he barely played for the Cougars. Upon his retirement, the 35 year old Julians was immediately appointed as coach of the Cougars. The year 1983 started on a disastrous note for Gor Mahia. The club looked set to pick up where they left off after the 1982 season which was perhaps the most disastrous in the clubs history until that point. 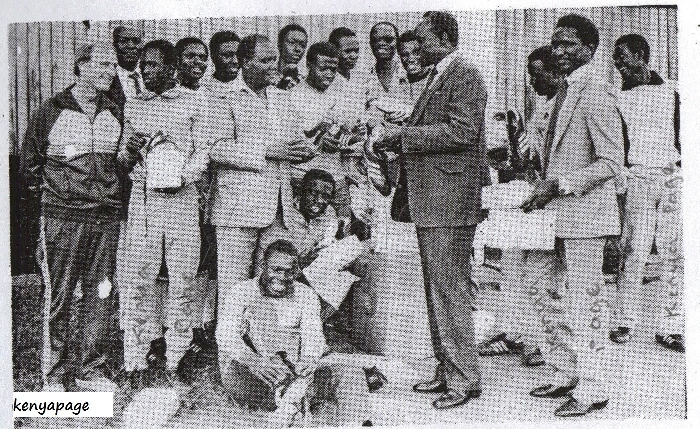 The 1983 season started with the CECAFA club cup that was held in January of 1983. Kogalo made an unceremonious exit when they lost the first two games to rivals AFC Leopards and to Uganda’s SC Villa. After the tournament, a Ugandan official admitted having succesfully bribed some Gor Mahia players. Then came the 1983 cup winners cup in which Gor Mahia inexplicably lost 0-3 at home to Vital O of Burundi after having won the 1st leg away 2-1 in Bujumbura. In the Kenya National Football League, Gor Mahia started with a 1-1 Draw against Nzoia, a 0-1 loss to Motcom of Kakamega and a 1-3 loss to Kenya Breweries. Fans were already furious at the club officials for the unceremonius losses at continental level had finally had enough. They demanded changes. Many wanted chairman Zack Mbori out. Mbori and club patron Joab Omino under pressure, decided to look abroad for a coach. In came Len Julians to take over from Jerry Imbo and his assistant Peter Ouma who seemed overwhelmed by the situation. Immediately upon Julians arrival, Gor Mahia who had not won a single league game, bounced back on their visit to Mombasa beating Kenatco and Cargo (now known as Bandari) 1-0 and 3-1 respectively. Midway through the 1983 season, Gor Mahia were in second place, only a point behind military side Scarlet. Midway through the season, Gor Mahia beat English premier league side, Norwich city 4-2 in a friendly match. With two games left before the end of the league, Gor Mahia had clinched the league with a memorable 1-0 over rivals AFC Leopards. Commenting after the game, coach Julians said “I feel so good that the young boys have done so well in the short period I have been with them”. They finished the league having scored 80 goals in 38 games. Gor Mahia under Julians were playing brilliant champaign football. Most importantly, Julians had turned a group of young inexperienced players into superb players. The likes of Charles Otieno, John Okello “Zangi” who joined from Kisumu Police, Hezborn Omollo who joined from Baba Dogo FC and Abdallah Shebe. All had joined Kogalo from obscure lower division teams and Julians had turned them into international calibre players. The youthful Sammy Onyango became one of the most complete players ever to play in Kenya. Indeed the one aspect that Julians is legendary for was his ability to mould talented players into first class performers. Perhaps it was due to the fact that during his playing days, Julians played in a variety of positions which made him perfectly suited to coaching several different positions. Julians also had a fierce temper and was often seen giving players the “hair dryer” treatment from the bench. Hezbron Omollo who had joined from a Nairobi provincial side known as Baba Dogo., immediately became a premier goal scorer. In his first season in the league, Omollo finished second in the league in scoring with 20 goals. He had developed a knack for popping up in the right place at the right time to finish off moves by team-mates like Zangi, Engine, Jogoo but especially Shebe with whom Omollo had developed a telepathic understanding. Charles Otieno was nicknamed “the engine” by Julians because according to Julians, it was he who literally functioned as a power supply for the team. Zangi was only 18 but had the confidence of a veteran. He had a combination of speed, grace and directness that sent Kogalo fans into raptures. Shebe had brilliant ball control and an innate ability to create chances by drawing the defence and releasing team-mates in scoring position. Gideon Hamisi playing as an attacking midfielder, became lethal in front of goal, scoring 12 league goals that year. Veteran AFC defender , Josephat Murila recently indicated that the most difficult players to mark were Gideon Hamisi and Sammy Onyango because they could score goals from impossible situations. Come 1984, Gor Mahia lost Charles Otieno to Kenya Breweries but signed George Onyango “Fundi” from Cargo via Lake Warriors. Also joining the team was Malindi based Abbas Khamis Magongo who had defected from Tanzania earlier on. Whereas Magongo was a decent player in the Tanzanian league, under Julians he became a brilliant midfield operator with the ability to single handedly dominate and control the game. He may well be the best midfielder Kenya has ever produced although some will argue for Thigo. Fundi became a visionary playmaker with a knack for scoring crucial goals. Hezborn Omollo finished as the league leading scorer in 1984 with 23 goals. Gor Mahia scored an incredible 86 goals in 34 matches. That was way ahead of second placed AFC who scored 73 goals. In the last day of the league, they beat Lake Warriors 2-0 to clinch the title. Since its formation, Gor Mahia had never won the league twice in a row. After the match Julians was carried shoulder high by fans as the rest of the players took a lap of honour. In 1985, Gor Mahia had built such depth that even with the suspension of 6 key players, they were able to win the CECAFA cup held in Sudan. New players like Swaleh Ochieng, William Obwaka, Tirus Omondi and George Odembo “Nyangi” were also become classy players thanks to Julians tutelage. Shebe became good enough that in a friendly match against visiting Swiss side Schaffhausen, he was able to earn a trials. He thus became the first Kenyan to play in a top European league. Gor Mahia won the league for the 3rd time in a row with a 5-1 win over Kisumu Hotstars and were winning in style. Julians then left Gor Mahia and headed back for another coaching stint in the United states. By the time he left, he had moulded at least a dozen players who became stalwarts for the national team and helped Gor Mahia to superlative performances in the African cup competitions between 1987 and 1989. When Kenya reachced the All Africa games finals in 1987 and qualified for the 1988 Africa nations cup, nearly half the players were Gor Mahia players and Len Julians products. Players like David Ochieng, Tirus Omondi, Austin Oduor, Charles Otieno, Abbas Magongo, George Onyango “Fundi’, George Nyangi and Sammy Onyango. Julians was to return again in 1991 much to the elation and excitement of Gor Mahia fans. He led the team to win the national league. Tom Odhiambo and Jared Ochieng Achieng formed a forwardline combination reminiscent of Shebe and Omollo in 1984. Felix Otieno’s inspirational midfield play reminded people of George Onyango fundi while Allan Odhiambo was a mix of Charles Otieno’s industriousness and Isaiah Omondi’s enforcer mentality. This time however, Julians stint at Gor Mahia lasted only one year. He left Gor Mahia at the end of 1991. In truth, the clubs precarious financial position meant they could not afford Julians. It is not known where his coaching career took him after the 1991 season. Sadly Julians passed away on December 17 1993 in Southend England. The entire Gor Mahia fraterneity mourned his passing. Condoleneces were sent by then Club Chairman Joseph Ogode, patron Joab Omino and by former players and officials. At the time of his death, Julians owned a car repair garage in Meopham with former team-mate Bryan Snowden with whom he played at Millwall. Meopham is a village that is 40 kilometres southeast of London. In a match played at the City stadium, Collins Okoth scored a dramatic equalizer in injury time to allow Gor Mahia to salvagae a point . Karurturi sportc slub had taken the lead in the 63rd minute when Jerim Onyango parried the ball into the path of a Karuturi player who duly scored from the rebound. Once again it was Gor Mahia who created more chances. But Heavy rain just before the game made conditions difficult for both teams. As the second half wore on, Karuturi employed time wasting tactics. The crucial equalizer came via a Demonde Selenga cross which found Okoth at the far post. Okoth finished with a superb volley. The draw leaves Gor Mahia in 2nd position with 35 points. After the match, the bitter Karuturi sport coach james Nandwa faulted the referee for adding toomuch injury time, claiming he was initimidated by Kogalo fans. Kogalo picked up three crucial points on their visit to western province. The match was played at Mumias complex after KPL deemed Bukhungu stadium unsuitable. Kogalo’s resident “rastafarian” , Moses Odhiambo, making a comeback to the starting lineup was once again the pivotal player, creating havoc in the Stima defence each time he touched the ball. In the 37th he set up Ochomo with a glorious chance but Ochomo missed the chance. 7 minutes later, he ran dangerously into the Stima goal area but his goalbound shot was blocked. The match seemed destined for a goalless draw when substitute Kevin Omondi powered home a thunderous drive from 30 yards in the 85th minute. The match gave Kogalo fans something to celebrate especially those who attended the match. It was welcome news especially after fracas ensued when Gor Mahia fans travelling convoy was attacked as they travelled through Luanda in western Kenya. Gor Mahia are still in 3rd place with 34 points. After a week off, Gor Mahia will face second placed Tusker in match whose winner could go to the top of the table depending on the score. The importance of this game cannot be underscored for both teams. The winner will have a leg up in the KPL title sweepstakes. A win over their primary challengers will also serve as a psychological boost for Gor Mahia or Tusker. It is amazing that Kogalo are this close to going tops. Only a few months back it seemed like Tusker was quickly running away from the pack as Ulinzi did last year. So intimidated were Tusker by Gor Mahia fans that they opted to play the first leg match in Mumias. Little did they know that not only do Gor Mahia fans travel but many actually live in Mumias and its environs. Trying to tame the Gor Mahia 12th man is an exercise in futility. Anyone who doubts it should ask Tusker. Gor Mahia players will be hoping that the fans turn up in droves and get behind the team. The Kogalo movement can now count several Odieros amongst its followers in addition to Kenyans of all backgrounds. The equivalent fixture last year ended with Gor Mahia winning 2-0 capped by a dazzling display by George Odhiambo “Blackberry”. The goal he scored that day with a mazy dribble past several hapless Tusker defenders will be remembered for many years by those who watched it live. Tusker players are probably still scratching their heads wondering how Blackberry bemused and befuddled them with a run reminiscent of Maradona vs England in 1986 or Leonel Messi vs Man U recently. Tall man Shikokoti could not unwind his long legs quickly enough to counteract Blackberry. He probably still sees Blackberry in his nightmares. Reports suggest that Collins Okoth “Gattuso” and Edwin Lavatsa will be missed due to injuries. But the likes of Akumu, Kevin Ochieng, Selenga, Odera etc are capable of filling those boots and Lavatsa has earned some rest after his stellar display against Ingwe 10 days ago where he played a crucial role in all 3 goals. Well done Lavatsa ! and quick recovery. 7000 fans attended the encounter pitting Congo United and Gor Mahia on Wednesday, yet Congo as the home team went home with a paltry 43,500 shillings as gate collection. The Mombasa municipal council and FKL were in charge of the gate charges and announced that only 203,000 out of a possible 1million shilling was realized. Congo also claimed Mombasa Council agents who manned the gates during the Congo/Gor Mahia FKL Cup match “fleeced” the club of money, ending up receiving a paltry Sh43,000 from a well attended match. Even for lowly attended matches, Congo makes Sh160,000 to Sh300,000 at Mbaraki. In a record breaking match, like against crowd-pullers Gor Mahia, Congo made over Sh700,000 at Mbaraki. The club said that over 7,000 fans attend their FKL Cup match, higher than all their previous matches at Mbaraki, but gate-keepers announced a taking of only Sh203,000. Congo said they anticipated over Sh1 million to be collected. “We were cheated by council officials. How can soccer develop when we are still engaged in corruption,” asked Cong United vice-chairman Evans Mzungu. This situation mirrors what happened in July of 2000 when Kenya faced Swaziland at the very same Mombasa municipal stadium. In that occasion, close to Ksh 1 milllion dissapeared and has never been recovered. According to a story in the Daily Nation, Chairman Ambrose Rachier has been asked to resign by branch officials. At a meeting held at the Professional Center in Nairobi, the officials passed a number of resolutions regarding Rachier’s candidature for the forthcoming football elections. Led by Gor Mahia’s organising secretary Tom Ataro, they requested Rachier to relinquish the club’s chairmanship to concentrate on the campaign for the national seat. “We as the members of the club were not consulted by Rachier before he decided to offer himself as a candidate for the post of chairman in the forthcoming football elections and we are not backing him wholesomely as our fans are not happy with certain issues in the club,” Ataro said. “Before he relinquishes office as our chairman, we need to see the audited report of the club’s account for the last three years,” he added. “He has refused to address this issue for a long time. Our fans are not also happy regarding the Tuzo deal and merchandising,” he said. Meanwhile Rachier has launched his blue print for the elections. Rachier says its time for fresh start in the way Kenyan football in managed. You cannot teach an old dog new tricks. There is need for fresh blood because the standards of football in the country have dropped into the abyss and some of the people running for election were in charge.”“I have a good track record, and my management of Gor Mahia speaks for itself. I have also met all the qualifications laid down in the electoral code,” he added. The manifesto addresses all critical aspects of football development, but is very big on the welfare of retired players, referees and other football administrators. “It is a shame that some retired players have turned into beggars after quitting the football . We will come up with a saving mechanism for them so that when their playing days are over they can still afford to live a decent life,” he says in the manifesto. Rachier’s manifesto is also big on governance and proposes to come up with a transparent and accountable structure. However some will challenge Rachier on this by suggesting that he has not been transparent in his dealings as Gor Mahia chairman. Another focus of the manifesto is the strengthening the finances of clubs in the country and proposes to stop all deductions and levies for all league matches as well engage local authorities in a bid to reduce charges for hiring their facilities. Rachier further promises that his administration will undertake to pay for air-fare for a contingent of 25 players and officials when local clubs represent the country in international matches. He proposes to ensure that all committees of the new federation are independent as well as the training of referees and all other technical people. Gor Mahia is a beneficiary of a resolution passed by clubs during the grand draw held on June 22 at the Nyayo‘s Kenya National Sports Council (KNSC) boardroom. “All representatives of the teams participating in the tournament at the meeting signed the clause that allowed five losers in the second round to be allowed to sail to the third round. However the decision has been met with howls of derision by other clubs, most notably Sofapaka and Congo United. Congo United coach Gilbert Selebwa told Supersport.com early Thursday that it was absolute meaningless to feature in the tournament if losers will be allowed to continue in the event. “This is a knock-out tournament. We cannot admit losing teams through the back door. Those who lost should accept defeat and move on. Otherwise this tournament will be rendered meaningless,” said Selebwa. Sofapaka Chief Executive officer (CEO) Pastor Jimmy Amboje said the rule was “pure robbery” to winning teams and argued that they will protest the decision. The above comment from Sofapaka is ironic considering that they led the charge to boycott the FKL cup. The decision is a relief for Gor Mahia fans, many of whom are eager to see the club play continental football. In a match played at the newly renovated Mombasa municipal stadium, Gor Mahia were unceremoniously beaten in the FKL cup by Congo United. Gor Mahia who had flown to Mombasa in yet another unprecedented event were literally brought down to earth when they lost on penalties (10-9) to Congo United. The Mombasa side has proven a tough nut to crack having forced Kogalo to a 2-2 draw in the 1st leg. Wednesday was no different. Congo dominated the 1st 20 minutes but Kogalo then took over the proceedings. In the second half, both teams were redueced to 10 men. Wycliff Ochomo was ejected for a second bookable offense. The game ended in a barren draw and went on to penalties. All players from each team took penalties, including the two goalkeepers took penalties after Rama and Mwangili Selenga missed theirs. In the second round of the penalties, Erick Masika, who had scored the opening penalty for Gor Mahia, had his penalty saved by Evans Omondi, while Rama, who had missed his first penalty, scored the winning penalty for Congo. Scorers for Gor Mahia were Mohammed Musa, Moses Odhiambo, Nasio Solomon, Moses Otieno, Fred Onyango, Christopher Wekesa, Kevin Ochieng and Kevin Omondi. Coach Zico said his players were tired after playing against AFC Leopards on Sunday. Which begs the question as to why well rested players like Ezekiel Odera were not used. Indeed Gor Mahia played very well in the first half but could not break through. Gor Mahia fans will now be hoping for a reprieve that will see them stay in the tournament as the best loosers.